Yes. You can scream all you want, but yes, the notebook is dying. First it was the death of the netbook, and now analysts are piling on Best Buy's CEO remarks about iPad cannibalizing laptop sales by 50%. Morgan Stanley notes that notebooks' year-over-year growth was negative for the first time ever this August. They have gone as far as saying that "tablet cannibalization"—chiefly by Apple's (AAPL) iPad—is at least partially responsible." 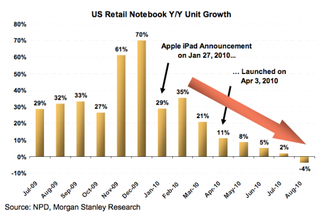 That growth is negative doesn't mean that notebooks are not selling anymore. We don't even know if the pattern will continue in 2011, although chances are that it will. But there is a pattern now. Actually, the pattern has been there for a while. Back in 2009, the Wall Street Journal was reporting on how companies like Verizon were replacing on-the-field laptops with Blackberrys. 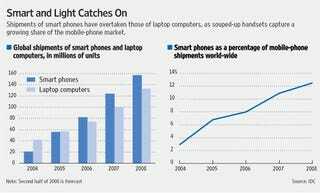 By the end of that year, they had switched 12,000 laptops to smart phones. The news now is that the retail laptop market is not growing anymore, confirming that trend. In fact, growth has been steadily decreasing since March—even while new, faster, cheaper laptops have been introduced since then. The incoming September numbers show another 4% decrease. That's one of the reasons why manufacturers like Dell, Samsung, and HP are racing to get their own tablets in the market before Apple becomes unstoppable in this new computing world. If you think that HP wasn't thinking about this trend when they bought Palm, you are seriously mistaken. So, are tablets the end of the laptop? Perhaps it is too early to tell now—even with the loud and clear numbers—but yes, yes they are. Eventually, it will happen. New computing formats have been replacing old computing formats since the beginning of the information era. Just a few years ago, some people couldn't believe the desktop market was going to become stagnant. But it did, and today many people only use laptops. Just like when people couldn't believe that the command line was going to be replaced by the Graphical User Interface. The same will happen with tablets. Laptops will not disappear. Not now, not right away, and maybe not ever. Like the desktop, they will survive for years on different industries and enterprises. Eventually, however, I'm sure they will vanish completely except for a very few specialized niches, just like they have disappeared for many workforces who have moved from traditional computer platforms to smart phones. So what will happen with the keyboard, you ask? I can't type on a tablet! Well, I write for a living, so I understand that concern. I know I will keep using keyboards until new input methods replace them. But now think about the immensity of people who, unlike you and me, don't touch a keyboard at all or touch it just barely, to send "hey, see you at 5! LOL! xxxooo" mails or write Facebook messages or chat with contracted words and emoticons. Think about the majority of people who, outside their work offices, never touch and don't want to touch a keyboard. Think about the huge number of blue collar workers who don't use computers in their work, who just depend on their phones to communicate. Think about the increasing number of office workers who have moved from desktops and laptops to their smart phones. And in addition to all those, think about that big majority of consumers who don't give damn about computers.